There are currently limited dedicated resources to inform management for people with severe asthma. Further, many of the contemporary asthma messages and resources are not tailored for people with severe asthma. The Severe Asthma Toolkit was developed to address this unmet need. Severe asthma effects between 3% and 10% of the asthma population. People with severe asthma can experience significant health, psychosocial, and financial problems. The disease also results in a significant impact on the families and carers of people with severe asthma, and on society. Severe asthma is a heterogeneous condition, which means it is made up of different components, that may or may not be present in each person with severe asthma. This poses a challenge for both recognition and management of severe asthma (Pavord et al. 2018). Asthma: that is confirmed by a compatible clinical history of episodic respiratory symptoms, responsive to short-acting B2-agonists, and with objective evidence of variable airflow obstruction. High dose therapy: involving inhaled corticosteroids and long-acting bronchodilators. Definitions of inhaled corticosteroid dose are available in the Australian Asthma Handbook and the Global Initiative for Asthma (GINA) Global Strategy for Asthma Management and Prevention 2018 (Box 3-6). Poor control: that is evidenced by persistent asthma symptoms, asthma exacerbations (flare-ups/attacks), incompletely reversible airflow limitation, and life-threatening attacks. People with severe asthma experience many different problems across several different areas such as airway disease, relevant comorbid diseases, behavioural issues, and risk factors. Systematic multidisciplinary assessment and management is an effective way to address these issues and the heterogeneity of severe asthma. This approach is also known as ‘treatable traits’ (Agusti et al. 2016). When managing a patient with severe asthma it is important to first recognise and address the issues that cause the symptoms, the attacks and the physiological changes. Difficult to Treat Severe Asthma: this term refers to people who have unaddressed issues in the comorbidity and behaviour/risk factor domains. Identifying and managing these issues can lead to improved asthma control. Some problems are a high priority for assessment and management. These include correct inhaler device technique, adherence to maintenance medication, and those comorbidities that relate to future severe asthma exacerbation risk. Validated questionnaires can be used to identify comorbidities in severe asthma (Radhakrishna et al. 2017). Severe Treatment Refractory Asthma: this term refers to people with persistent severe asthma and where issues in the comorbidity and behaviour/risk factor domains have been identified and optimised. The next step for people with severe treatment refractory asthma involves identifying the underlying disease pathway (termed endotyping) or airway problem (termed phenotyping) and applying a suitable targeted therapy that is specific for that pathway or problem. The currently available options in Australia are omalizumab for severe treatment refractory allergic asthma, anti-IL-5 therapy (e.g. mepolizumab) for severe refractory eosinophilic asthma, long-acting muscarinic antagonists (LAMA) for severe refractory asthma with incompletely reversible airflow limitation, and azithromycin for severe refractory eosinophilic or non-eosinophilic asthma with frequent exacerbations. How is severe asthma managed? Systematic multidisciplinary assessment and management is an effective way to manage severe asthma (Gibson et al. 2010, Clark et al. 2017, McDonald et al. 2017). 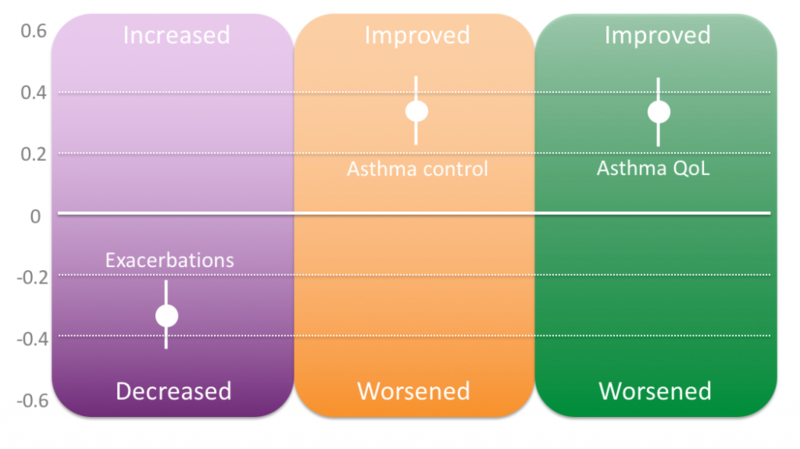 The different problems that can be identified and addressed in severe asthma are shown in the diagram below. Tools that are available to facilitate the assessment of these problems are described in the ‘Resources’ section of the Toolkit. 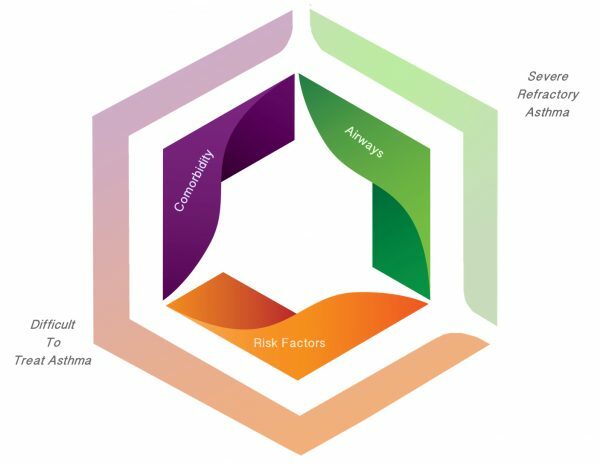 The models of care that can be used to implement this approach are described in the ‘Establishing a Severe Asthma Clinic’ section of the Toolkit. Systematic multidisciplinary assessment of severe asthma leads to an improvement in asthma control and quality of life, as well as a reduction in asthma exacerbations (Gibson et al. 2010, Clark et al. 2017, McDonald et al. 2017, Tay et al. 2017, Tay et al. 2017b). Effects of multidimensional assessment and targeted treatment based on meta-analysis of 3 studies (n=451 participants). Bars represent standardised mean difference with 95% confidence intervals. Data represented from (Clark et al. 2017).